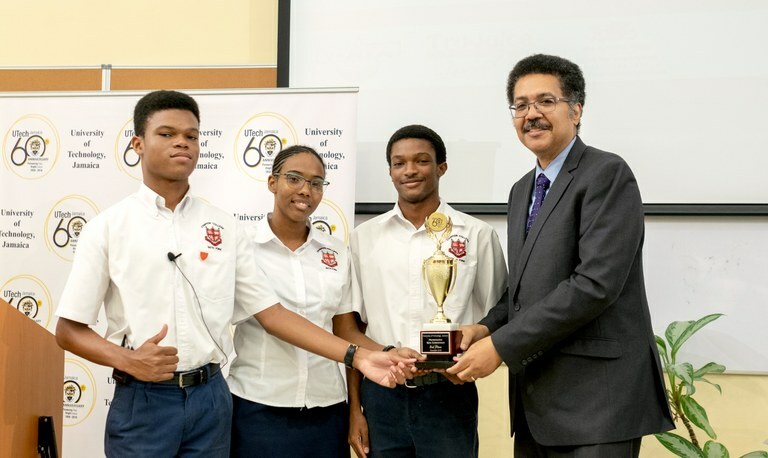 Knox College Wins 2nd Annual UTech, Jamaica Mathematics Quiz Competition — UTech, Ja. L-R: Professor Stephen Vasciannie, President, University of Technology, Jamaica, Mrs. Ave Maria McIntosh, Head, School of Mathematics and Statistics, Dr. Kamilah Hylton, Dean, Faculty of Science and Sport and Professor Colin Gyles, Deputy President congratulate the members of the Knox College High School team who emerged winners in the 2nd annual University of Technology, Jamaica Mathematics Quiz Competition held on Thursday, November 29, 2018 at the University’s Papine Campus. Displaying their trophy are, from left, Ruth-Ann Blair, Raheem Wilson and Kejhawn Brown, Captain. 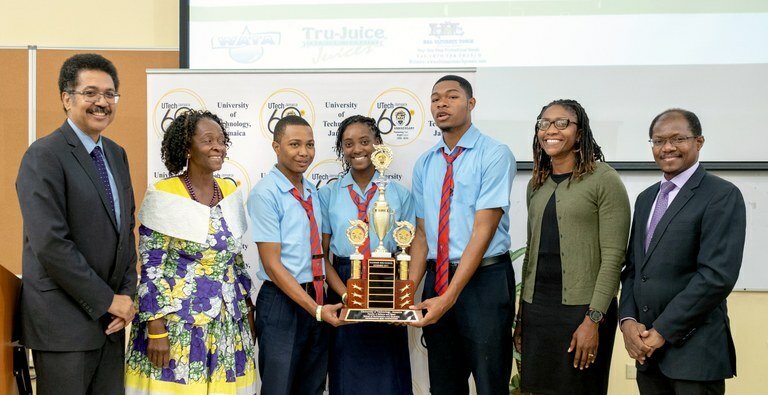 Senior high school students from Knox College firmly demonstrated their prowess in Mathematics in taking the winning title in the 2nd annual University of Technology, Jamaica Mathematics Quiz Competition held on Thursday, November 29, 2018 at the University’s Papine Campus. At the end of the final match, the Mathematics champions from the Clarendon-based Knox College comprising Kejhawn Brown, Ruth-Ann Blair and Raheem Wilson secured the win over Campion College, with a final score of 19 to Campion’s 8 points. The 30-minute final match was played in three exciting ‘Schools-Challenge’ style rounds with each team answering questions from the CSEC and CAPE Level 1 Mathematics curricula posed by Quiz Master, Miss Judith Delisser, Lecturer, SOMAS. Both teams impressed with their quick responses showing burgeoning competency in such areas as trigonometry, complex numbers, probability, polynomial and differential equations. At the end of the first six-minute round, both teams tied at 4 points each; but it was Knox College who showed its stronger mettle, as the team soared ahead, correctly answering questions such as; “3 blown bulbs are accidentally put along with 5 good bulbs in a box; if 2 bulbs are selected randomly without replacement, find the probability that the first is blown and the second is good.” The Knox College team correctly answered 15/56. The winning school received a trophy and cash prize of $150,000. The second place school also received a trophy and a cash prize of $100,000 from UTech, Jamaica. Gifts were also presented by sponsors H& L Ultimate Touch Promotion, Jamaica Biscuit Company and Wisynco to the students and their Mathematics coaches. 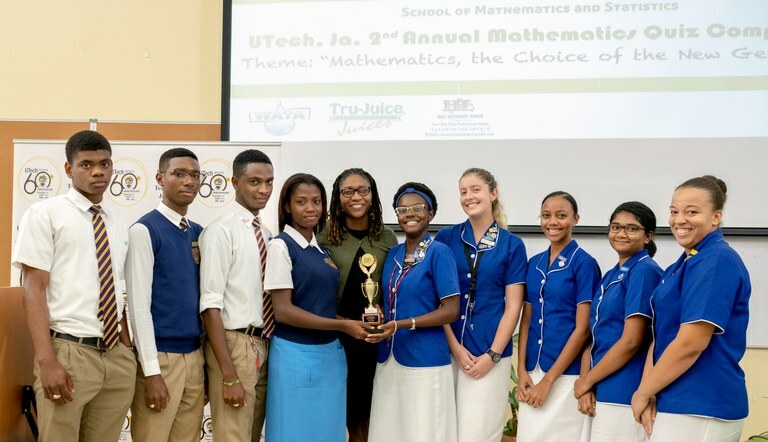 The UTech, Jamaica Mathematics Quiz Competition led by the School of Mathematics and Statistics, Faculty of Science and Sport, is part of the University’s thrust to increase interest and critical thinking skills in Mathematics to promote the importance and development of the subject as a tool for problem solving across disciplines. The Competition also seeks to generate a deeper appreciation for Mathematics among students at the secondary level in Jamaica and the wider Caribbean. 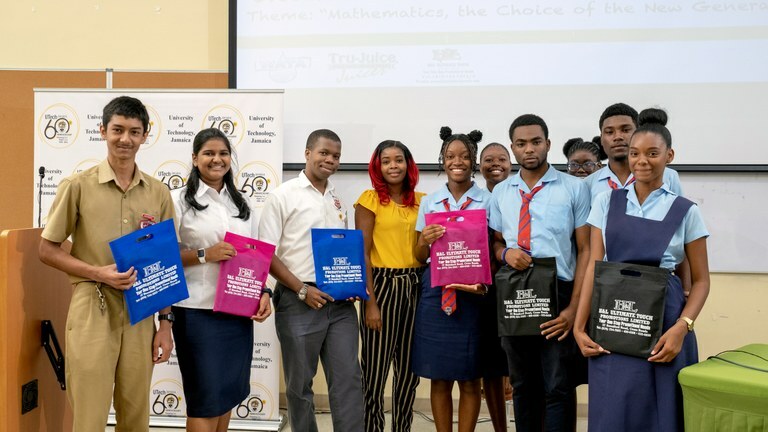 The 2nd annual Mathematics Quiz Competition which began with the preliminary round comprising 19 high schools from across Jamaica on November 17, 2018 was held under the theme, “Mathematics, the Choice of the New Generation.” The Competition is open to all high schools, technical, vocational, agricultural and community colleges. President, UTech, Jamaica, Professor Stephen Vasciannie, CD who conceptualized the UTech, Jamaica Mathematics Competition in his remarks, congratulated the finalists and all the participating schools. He noted that the teaching and learning of Mathematics in Jamaica needs greater attention, but highlighted with pride that the UTech, Jamaica Mathematics Quiz Competition showcases Jamaican talent in the subject, at its best, while serving to help students to prepare for their CSEC and CAPE level exams. The President thanked the teachers and parents who coached, guided and inspired the students’ love and development of their skills in Mathematics. Professor Vasciannie also commended the Faculty of Science and Sport, led by Dean, Dr. Kamilah Hylton and Vice-Dean, Mr Patrick Williams, chief competition organiser, Mrs. Ave Maria McIntosh and their supportive team of faculty members and administrative teams. Mrs. McIntosh in moving the vote of thanks specially acknowledged the academic and administrative staff of the School of Mathematics and Statistics for their dedication and hard work as quiz masters, time keepers, scorekeepers and question writers. She also expressed gratitude to Mr. Herter Simpson, Lecturer, School of Natural and Applied Sciences along with his team of students and technicians who were responsible for providing the buzzers for the speed section of the competition. Greetings were received from Mr. Romaine Thomas, Secondary Mathematic Coach, Ministry of Education, Youth and Information who represented Dr. Tamika Benjamin, National Mathematics Coordinator. Mr Thomas congratulated UTech, Jamaica on the staging of the Mathematics Quiz Competition which he noted supports the goals and objectives of the Ministry’s national “Math Counts” campaign. First year student, Garth Reid who is reading for the BSc in Mathematics and Education shared with the students his inspirational story of overcoming challenges and a failed first attempt in CSEC Mathematics at his former Jonathan Grant High School, to now preparing to teach the subject at the high school level following his graduation from UTech, Jamaica. President Stephen Vasciannie, (right), UTech, Jamaica presents the Campion College team with the 2nd place trophy. Team members from left are Dominic Cupidon, Abigail Christie and Kevon Findlay, Captain. Students from Campion College and Knox College display gifts received from sponsor Miss Sherene Fearon, (4th left), Office Manager, H & L Ultimate Touch Promotion. Dr. Kamilah Hylton, (centre) Dean, Faculty of Science and Sport, UTech, Jamaica poses with semi-finalist students from Ardenne High School and Immaculate Conception High School. From left are Justin Lynch, William Brown, Kobe Cargill and Sarrah-Ann Allen of Ardenne High School and Athena Pagan, Katara Finlason, Brianna McKenzie, Shyamaleewary Dayanandan and Jemelia Gordon of Immaculate Conception High School.